Students from across campus all have the opportunity to participate in any of the choral ensembles at Fort Hays State University. Contact Dr. Terry Crull, Director of Choirs, to learn more. The Concert Choir is the premier mixed ensemble at FHSU, and is made of of 50-65 singers from all across the campus. Placement is by open auditions held at the beginning of the year. 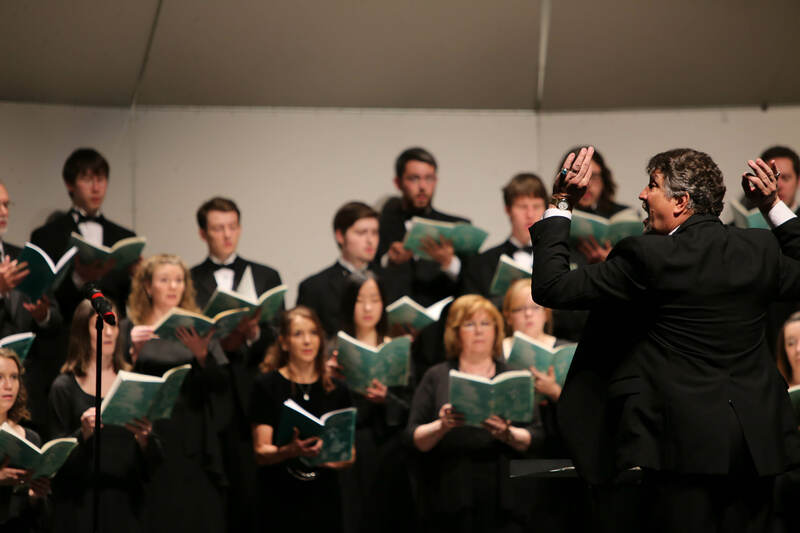 Concert Choir performs a wide range of choral literature from the classics to music of contemporary composers, and is recognized for excellence in choral performance. The Fort Hays Singers is a 16-20-voiced select ensemble specializing in choral chamber music from a variety of music style periods. Recent international performances for the Chamber Choir have included Austria and Taiwan, and the group takes regular regional tours. The Women's Chorale is open to all women on the FHSU campus. Placement in the group is by open auditions held at the beginning of the year. The great wealth of choral literature written for SSAA voices will be explored, and performances are in combination with the other choirs on campus as well as one or two separate performances each semester.